8.2.1 Work to ensure there is strong and stable renewable energy policy. 8.2.2 Support projects in gaining access to electricity networks at a reasonable cost and timeframe. 8.2.3 Advocate regulatory changes necessary to facilitate community off-grid or micro-grid systems. 8.2.4 Promote rights for projects to sell energy at a fair price. 8.2.6 Work with State and Territory Governments to develop programs to support community energy. 8.2.7 Help establish dedicated community energy support policies. 8.2.9 Advocate for supportive planning assessment frameworks for community energy projects. This sub-strategy addresses the range of government interventions and support programs that are needed to realise the vision for a vibrant community energy sector. Foster a policy and regulatory environment that proactively removes barriers to and supports the growth of the community energy sector to reach its full potential. International examples demonstrate that strong policy that supports increased penetration of renewable energy and energy efficiency is a necessary precondition for – but not a sufficient condition in and of itself to create – a vibrant community energy sector. A recent review of international community energy policy 1 shows the strongest renewable energy sectors have the strongest community renewable energy sectors and vice versa. Stable and supportive policy is essential to the growth of the community energy sector, particularly allowing community energy models to evolve from a concept to widespread replication (see Appendix D). In Australia, the main policy mechanisms that have supported renewable energy including community energy are the Renewable Energy Target (RET). Legislated agencies such as ARENA and the Clean Energy Finance Corporation (CEFC), or similar equivalents, have the potential to play a significant roles as the community energy sector evolves. As such, it is in the interests of the emerging community energy sector that these policies and supporting organisations be maintained and strengthened. The RET was found to be particularly critical to the economic viability of all investment based models of community energy (refer to cost modelling in Appendix F), even though community investors may be willing to receive lower rates of return than institutional investors. A 30% decline in RET-driven income results in an average 11% reduction in total project income for wind projects, and 6% reduction in total project income for solar projects, which has a critical influence on financial viability of these models. The current grid connection approval process for distributed generators above the ‘deemed’ connection limit of 5 or 10kW is often onerous, unclear, provides no certainty for proponents and offers limited effective means of negotiation or appeal. not proceeding due to this high degree of uncertainty. Analysis underpinning cost modelling (Appendix F) indicated that grid connection can add significant cost to community wind models. For example, grid connection is currently anticipated to account for 18% of the upfront monetary costs of New England Wind. For Hepburn Wind, complications associated with being the first wind-farm to connect to the distribution network led to an additional unforseen $300,000 in extra technology costs, and $600,000 in lost revenue due to being constrained for the first months of operation. This problem restricts the capacity of consumers and communities of all scales to invest in distributed generation. This priority involves advocating for grid connection processes for community energy projects that is timely, efficient, cost reflective, standardised, accessible, transparent and where proponents have recourse to effective arbitration when negotiations fail. This priority initiative will likely entail the development of a rule change proposal or participating in existing rule change processes. As such, this priority initiative will help create the regulatory structures that enable and do no hinder community off-grid or micro-grid systems, including investigating the potential for communities to buy-back their grid. being non-scheduled generators (price takers), renewable energy projects place downward pressure on wholesale prices. While this benefits all consumers, it reduces profits to the vertically integrated and hedged retailers. the volume of energy provided by community energy generation projects are not of a scale that suits the high-volume preferences of most retailers. Sell directly to a customer behind the meter through a PPA (retail exemption), loan or lease style of arrangement. Register with AEMO as a Market Generator and sell energy on the spot market. This involves high registration fees, prudential and other costs and exposes projects to unacceptable price volatility. Sell GreenPower, noting that GreenPower is a voluntary market for Large Generation Certificates. This priority initiative is about working out how to best ensure that community energy projects can secure a fair price for their electricity. The majority of community energy models are based on the idea of many small community investor-members, however current regulations, specifically the Corporations Act makes it very difficult. In particular, small (<100kW) behind the meter solar projects with many community investors are not economically viable. This is because the compliance cost and requirements for projects with more than 20 investors contribute to making community energy projects financially unviable. For medium scale projects that are viable, this item can represent the one of the most significant project development and ongoing cost factors increasing overall monetary costs or volunteer time commitments (see Appendix F). Example requirements include, but are not limited to restrictions on public offerings and advertising without a costly prospectus (known as anti-hawking provisions, see Section 734 of the Corporations Act) and possibly needing an Australian Financial Services Licence (see 911A of the Corporations Act). The authors of this strategy understand that the compliance requirements and thresholds within the Corporations Act and the Cooperative National Law for example are done to protect consumers from ill-conceived or unscrupulous/predatory investments. As such, this priority initiative will involve the development of ideas including possible exemptions that would both address the cost prohibitive nature of compliance requirements for community energy groups while still protecting consumers. This priority initiative will work alongside the shared infrastructure platform initiative in the Finance and Funding sub-strategy, which looks at ways to address these issues, within the current regulatory framework. Internationally, the UK and US have both reviewed their laws looking at small community equity investments in many types of projects. Specifically the US has granted an exemption to certain provisions within these laws to Mosaic, a solar equity/investment-based crowd funding platform, while in the UK exemptions have been granted to Abundance Generation. Thus while these organisations’ operations are still regulated ensuring investor/consumer protection, the costs to community energy projects are lower. Specifically, this priority initiative will look to input into the ongoing process exploring equity crowdfunding. Already a number of community energy groups and support organisations have provided submissions to the Corporations and Markets Advisory Committee’s (CAMAC) Review of Crowd Sourced Equity Funding in 2013. This priority initiative will facilitate community energy stakeholders to continue to input into the ongoing policy discussion that resulted from the CAMAC and a subsequent 2014 review. The NSW Regional Clean Energy Program (RCEP) has been a significant champion for and driver of community energy in NSW and in Australia more broadly. The RCEP consists of a central team and six regional coordinators who support clean energy uptake in their regions, with an increasing focus on community energy projects. In addition to staff support the RCEP has coordinated two community energy grant programs and has funded a number of priority initiatives, such as the development of the Community-Owned Renewable Energy How to Guide. In the ACT, the Environment and Sustainable Development Directive (ESDD) has also supported community energy projects through funding and a wind and solar reverse auction. 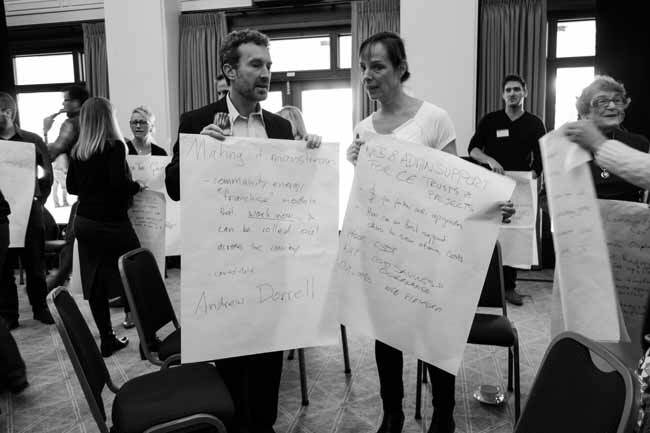 The cost modelling exercise (Appendix F) revealed that more than half of the operating models of community energy received government support to get their first projects off the ground, and thus can be considered a common feature of success. The ACT’s reverse auction feed-in tariff for 200MW of wind having selection criteria dedicated to community benefit sharing and community engagement. The Scottish 500MW and Thai 800MW targets for community owned renewable energy. A Community Clean Energy Target. This idea gained traction at the recent Community Energy Congress and would apply a similar approach to the federal Renewable Energy Target but specifically for community renewable energy projects. Reverse auction feed-in tariffs for a specified amount of community renewable energy generation. Opening up government building roof space as potential host-sites for community solar projects and working with community energy proponents to make this model economically viable and socially and environmentally beneficial. Direct Power Purchase Agreements for the government’s Large Generation Certificates (LGCs) liability with community requirements in the selection criteria. As a large electricity users, governments have large liabilities for renewable energy certificates. Typically, this will get covered through the normal energy retail contract. However, governments could renegotiate their electricity contracts removing the LREC liability and then go to tender for LRECs from new renewable energy projects in their state. This way they would guarantee their LREC liability was met from their state and they could include community engagement and benefit sharing criteria in the tender process. Encouraging increased community benefit sharing and community engagement in larger renewable energy projects. This priority initiative is a subset of #4 ‘Promote rights for projects to sell energy at a fair price.’ Currently community energy projects are only financially viable if they are mid-scale and compete on the wholesale market, have a Power Purchase Agreement (PPA) or if they operate ‘behind the meter’ (such as community solar on commercial sites), attracting close to retail value for their generated energy. This restricts projects to specific sites with sufficient available load, and limits the opportunities for community energy projects to sell energy to their members. Virtual Net Metering (VNM) is a proposed arrangement that would overcome this barrier by allowing distributed generators to sell their ‘exported’ electricity generation to other nearby sites, using a smaller charge the use of the local grid. In doing so it would provide distributed community energy projects with a fair price for the energy they generate and export to the grid., and a direct contractual connection with members or other local buyers of the energy. The initiative involves the identification and development of specific methodologies to value the contribution of local exports to the electricity grid, underpinned by the principles of cost and value reflectivity. The ultimate goal of this initiative is the development of a Rule Change Proposal to allow VNM on public electricity grids, which would see appropriate charging for local use of the system, and a new business model for electricity networks into the future. The planning process is a significant step in the development of larger community energy projects. The planning assessment framework can either help or hinder the development of community energy projects. For example, currently in Victoria, the wind energy planning process – VC82 – is often referred to as the toughest planning regulations for wind energy in the world. With No-Go Zones, 2km ‘set-backs’ (distance to the nearest resident) and 5km set-backs from towns, this planning policy has effectively stalled most wind development in the state. This priority initiative is about advocating for the removal of these No-Go Zones set-backs and supportive planning frameworks to be instituted that recognise the significant community engagement and community benefit involved in developing and operating community energy projects. There are many policy and regulatory barriers to community energy. Additionally, there is significant international precedent for governments to actively encourage community energy projects and the development of a community energy sector. Proactively incentivise and support the creation of community energy projects. These are three roles that governments can play in helping to meet the vision for a vibrant community energy sector. It is hoped that a range of government departments and policy makers from across Australia will use this Strategy to inform the development of community energy policy. However, this sub-strategy is framed for community energy advocates and actors, acknowledging that non-government actors will play a significant role in putting community energy on the policy agenda. Governments across the world are recognising the unique opportunities and benefits presented by community participation in sustainable energy deployment. Countries such as Germany and Denmark have had policies in place to incentivise community renewable energy for decades. Others such as Japan, Thailand, the US and Canada have introduced similar policies more recently. As such, there is a growing rationale for policy support for community energy that actively helps mainstream a community approach to sustainable energy. It is also important to note that most of the best practice examples of community energy support internationally occur in countries or states with strong policy environments for renewable energy more generally. A strong and stable policy environment for renewable energy has been important for creating the broader context within which community energy projects develop. Policies such as renewable energy targets, grid connection arrangements, energy market rules, tax incentives and financial support drive the development of a renewable energy sector in these countries. Support for community energy is then layered as additional incentives on top of these, in recognition of the unique opportunities, benefits and challenges of community scale and orientated projects. In order to understand how the objectives outlined in this sub-strategy can be achieved, it is important to understand the different types of regulatory reform and policy mechanisms available and which jurisdictions or agencies can implement them. Australian Energy Market Operator (AEMO) (to a lesser extent). The Community Energy Advocacy Strategy outlines in detail the role of each of these organisations in creating regulatory reform. While policy reform relates to a range of mechanisms that governments at all levels can institute, that are not specific to the National Energy Law and similar targeted pieces of legislation and subordinated Rules. The policy reform that this sub-strategy focuses on are those that state and federal governments could deliver to support community energy rather than at a local government level. Directly proposing changes to the National Energy Rules. To achieve material changes to the NEM generally requires a change to the National Electricity Rules . While most changes to the National Energy Rules are proposed by the COAG Energy Council (usually on recommendation of the AEMC), AER, AEMO, large scale energy generators, retailers, DNSPs or TNSPs and anyone else can propose a rule change. The AEMC has some flexibility in terms of how it goes about each rule change proposal process, although as the process includes at least two stages of public consultation and has to fit in with the AEMC’s own schedule, the formal rule change process can be expected to take over a year know whether a proposal is successful in any case. Encouraging the COAG Energy Council, jurisdictional governments or other parties to propose changes to National Energy Rules (NER). The COAG Energy Council is best influenced through individual members (jurisdictional energy ministers) and/or representatives of its Standing Committee of Officials. These mechanisms for policy and regulatory reform need to be carefully considered when the priority initiatives outlined in this sub-strategy move to the planning and implementation phase. Government Support Options for Community Energy: A Review of Best Practice International Policy undertaken by Community Power Agency in 2014 as a part of a larger review led by ISF of the NSW Government’s Community Energy Funding Program. UK Community Energy Strategy developed by the UK Department of Energy and Climate Change in 2014. Szatow, T., Moyse, D. 2014 What happens when we un-plug? Report by Energy for the People and the Alternative Technology Association. Ison, N, Langham, E, Hicks, J, Berry, F, Jackson, M and Mey, F (2014) “OEH Community Renewable Energy Funding Program: Strategic Review”. Prepared by the Institute for Sustainable Futures and Community Power Agency for NSW Office of Environment and Heritage, September 2014.